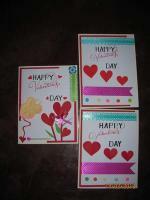 Card Making for Kids is a section on this cardmaking website for children. 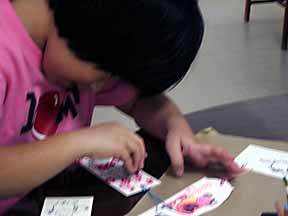 Kids love rubber stamping so we will use mainly rubber stamps, stamp pads, colour pencils, colour markers, and glue to entertain children and develop their abilities to express themselves through colours, compositions and drawings to make greeting cards. 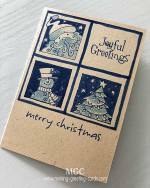 Fold A4 sized drawing paper into half to make a card blank. 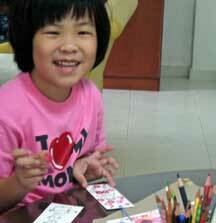 Help the child to stamp some images on another sheet of drawing paper with black or dark green ink pads. Let her color the stamped images with markers or color pencils. Help her cut out the images. Let her glue the stamped images into the front of the card blank. Help her write a note to whoever she wants to send that card to. They usually say that the card is for mommy or daddy. If so, the added anticipation of waiting for the card to return home will be a bonus. And see her face when the card arrives for mommy or daddy. 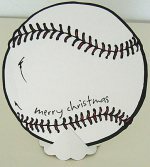 Let her decorate the back of the card. Put in an envelope and address it. Paste postage stamp on envelope and bring her to the post office to post the card. 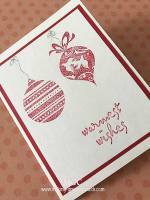 Step by step, explain to her the whole process of making a card to posting that same card. Have fun! And I believe you will have as much fun as your child. 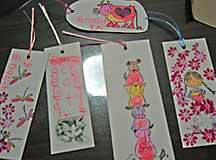 Here Belinda was spending happy time at my place creating some bookmarks (refer to the bookmarks above). She is absolutely enjoying herself. What a wonderful time we had. Let her glue the stamped images wherever she likes. You will also find that she will not stop at just pasting the cut-images to the card blank. 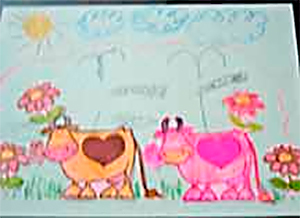 Most kids will also add their own drawings to the whole picture; e.g. clouds, flowers, sun, and especially their names. My nieces and nephew always print their names to their artworks. I guess it's a child's sense of pride in his or her own handiwork. Do not make negative remarks about a child's drawing or choice of color. Encourage the child to express herself. If you do not understand her drawing or choice of color used, just ask her and she will readily tell you why. You'll be amazed by her explanation. Any Ideas for Crafting with Kids? Do you have any idea or project to add to this section on card making for kids? Please feel free to email me your "card making for kids" contribution and I will turn it into a web page linked from the bottom of this page.